So far this year, there have been several rock solid releases in the melodic hard rock department. Jaded Heart, Harem Scarem, Crystal Ball, and Humanimal are just a few examples. Well, now we can add Frontline to that list. Frontline play 80's style hard rock with moderate keyboard use and catchy chorus lines that grab you upon first listen. Against the World sounds like it could have been released in the late 80's. The production is crystal clear and very polished, but the overall sound is certainly a throwback to the 80's. The harmony vocals are thick and melodic as hell complete with classic reverb and echoing effects throughout. The chorus lines are addictive and will beg you to sing along. The guitar solos are particularly impressive and bleed with emotion reminding me quite a lot of Steve Clark (ex- Def Leppard) or Andy Timmons(ex-Danger Danger) solos from back in the day. The lead vocalist shows flashes of Joe Elliot and Ted Poley throughout the album which fits this type of music like a glove. The band delivers ten quality tracks on this album, and I cannot find a single weak track amongst them. 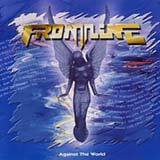 If you like 80's style hard rock with catchy harmony vocals and emotional guitar work, look no further than Frontline. I have found that treading familiar water can be a dangerous path for a band to take. Bands that do not attempt to be original must absolutely, without question deliver high quality of songs to balance their lack of originality. Otherwise, the band has nothing to fall back on and will thus not win any fans. Let me tell you, Frontline is anything but original, but they are excellent at what they do. Sure, they have their influences but who doesn't? These guys are able to take the best traits from their influences and merge them into a sound all their own and thus avoid coming across as a copycat band. Fans of 80's style hard rock bands, especially Def Leppard, Danger Danger, and later Fastway that don't mind a fresh blast from the past will find a lot to like with Frontline. Against the World is nothing new, but I assure you that it is excellent melodic hard rock!